Minsky Circle Algorithm. Generate sin and cos fast with only add, sub and shift. Sometimes we might want to generate a bunch of points that lie on a circle. Or perhaps a sequence of sin and/or cos values. For a tone generator say. The Minsky Circle Algorithm can do this using only add, subtract and shift operations. The Prop of course has a sin table in ROM but given the work required to index into that ROM correctly and scale the results there may be occasion when Minsky is less code and faster! The Prop II has no such sin table. // Generates circles (sin and cos) using only add, subtract and shift. let yOld = -7349;     // Amplitude, need not be any special value. Larger the better. const steps = 202;    // This number of  steps gives a full circle for the shift size below. console.log(xOld, yOld);               // The output, sin and cos basically. yNew = yOld + (xNew >> 5);             // angular step sizes around the circle. It's not a totally accurate circle but if you iterate around that loop forever it will produce stable (repeating) sin and cos values. Thanks Heater, that looks neat. I love your simplified explanation of an FFT too! Not having a signed shift right although I could create one out of ASR, I just wanted to check it out and just used a signed division by 32 instead. Anyway this is what I get in Forth although I will have to check it properly later. Or how about a full circle plot? Of course the "Minsky" algorithm is simply making use of the fact that the differential of sin(x) is cos(x) and the differential of cos(x) = -sin(x). That is to say the rate of change of one is proportional to the value of the other. So you just add and subtract a small fraction of one from the other and you get sin and cos. I first saw this in 1980, done in hardware! All you need is a couple of registers, some adders and a feedback loop. A little board of TTL chips. It was used to generate the rotating wave forms needed in those old vector graphic radar displays. It had probably been designed 10 years earlier before we had microprocessors. Thanks for the comment on the FFT commentary. Good to hear it made a bit of sense. It's not really close to explaining the FFT yet. That "weird" rule I have there for multiplying values gives rise to rotations (sin/cos) in much the same way as this algorithm. I have been puzzling how to write that FFT without complex numbers document since the "Fourier Transform For Dummies" document was posted here 5 years ago. I might get there eventually. Tuns out that using shift is not the same as divide. As you have noticed. The rounding errors are not the same. Not sure which is giving the more accurate result. The original Minsky is presented using a multiply by number less than one. Thanks for sharing this! I assume that this will also calculate sine values, right? Sure does. It produces a sin and cos value on each iteration. That's how we get a circle out of it. See the comments in the code in the first post. let cos = -7349;   // Amplitude, need not be any special value. Larger the better. cos = cos + div32(sinNew);   // angular step sizes around the circle. // Divide by 32 using shift. You would in line this in assembler. I can see that you are checking five bits after doing five shifts but....why? Very good questions. I'm not sure if I can answer very clearly. We find that when we do a division by a power of 2, like 2, 4, 8, 16, 32..., using a shift rather than an actual divide we get rounding errors. This is true no matter what language you are using. As far as I can tell the worst case of this is -1. Which is 0xffffffff. Shifting that just gives you 0xffffffff back again, which is -1, instead of the zero you want! So far we see the problem occurs for negative numbers, hence the test for "(x < 0)". Or in my recent edit (x & 0x80000000) which is just checking the sign bit of a 32 bit integer. Then we find the correction for rounding error need not be applied when the number we are dividing is a multiple of 32 (The amount we are dividing by). Hence the (x & 0x1F) checking that the low 5 bits are zero. Which is the same as a test with the modulus operator (-x % 32) == 0. Except of course that an & is a lot faster than a modulus which is actually a division. In short the checking of the low five bits is a check to see if the number is exactly divisible by 32, which it will be if the low 5 bits are zeros. Now, this is possibly not quite right. I can't really justify it to myself yet! But testing so far against actual division has always produced the correct result. Perhaps someone wiser than be can explain why. What I would really like is if someone smarter than me can tell us what frequency this runs at. Assuming we can iterate this at a constant "n" times per second, we have an output frequency that depends on the little fractions we are using 1/m, in this case 1/32. So the output frequency must be proportional to n and some how related to m.
If I understood that we could actually specify n and m to get a frequency we want rather than just guessing and tweaking. Ok Thanks for clearing that up, however I cant resist trying out new algorithms- even (especially) when I don't understand them, so I compared this with one I found by Adafruit (Bressingham?) using propbasic and plotting one circle on top of the other using 320 X 240 4 colour vga driver. It wasn't straight forward because the number of steps, shift number and amplitude (Radius?) all interact. In order to plot a 100 pixel radius circle I used an amplitude of -6400, a shift of 7 (not 5) and divided the result by 64 (by shifting 6 right). Here is a plot of minsky circle, with and without the rounding error correction, and an actual circle computed from cos and sin using floating point. Of course we can start with a bigger amplitude/radius and use bigger shifts, say $10000000 and 10. Then we get a circle that is a lot more accurate. I can't see any difference from a proper circle when I plot them here. Then the rounding errors are so small the rounding correction is not needed and the code gets simpler and faster. The down side is that yon need to iterate of 64 times as many steps to get all the way around the circle. Partly mitigated by having made the loop a bit faster. let cos = 0x10000000;  // Amplitude, need not be any special value. Larger the better. // I find it blows up after 0x7fffffe6 using 32 bit math. const steps = 6464; // This number of  steps gives a full circle for the shift size used below. cos = cos + (sinNew >> 10);   // angular step sizes around the circle. A few more observations just changing the numbers around. 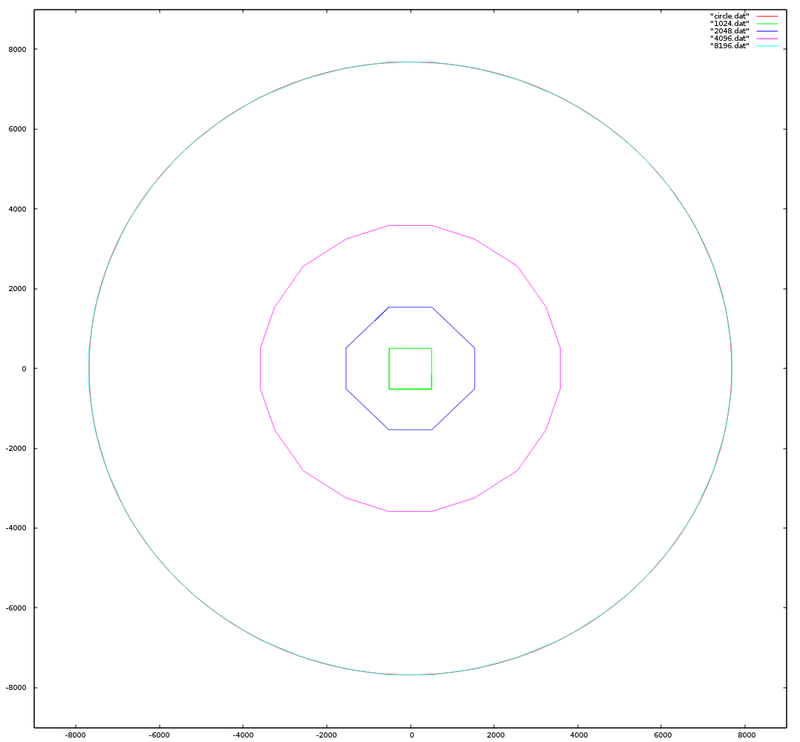 with a ystart of -3200 and steps of 18000 and shift of 10 the circle starts to look like a polygon and the 18000 steps gives 2 circles on top of each other which are not perfectly aligned. I realise that shifting by 10 = divide by 1024 which coarsens up the calculations - a shift of 11 actually gives a nice 8 sided polygon with beautifully straight sides, the vertical and horizontal sides being twice the length of the corners. I'm sure there are perfectly good mathematical explanations for this, and those sins and coses take up some strange values, but its so far over my head as to be rather frustratingly amusing. That's strange, I tried a shift of 11 and I still got a circle. If you are shifting by 10, a division by 1024, and your radius is only 4096 then most of your bits disappear in the shift. There is only 2 bits left. That means there can only be 3 possible values added/subtracted to sin and cos in the loop. 0, 1, -1. So it can only draw horizontal, vertical and lines at 45 degrees. Sometimes it amazes me that does actually come out as a nice octagon. As you radius gets bigger, more bits are left over after the shift and more directions of travel are possible. See attachment. Of course if you are working with such small radii, and don't need so much accuracy then smaller shifts can be used. Which gets you your circle points faster. You don't need any fancy maths to get an idea how this works. Imagine a graphs of a sine wave and a cosine wave. We can think of the "rate of change" of these curves. Rate of change is simply how much the line goes up or down as we move along the x axis. Clearly the sine and cosine have a zero rate of change at the top and bottom. They are neither moving up or down at those points. Also we see that the rate of change is maximum at the point they cross the x axis. Now, magically, it turns out that the rate of change of sine is actually the value of cosine, the bigger cosine is the faster sine is changing. Similarly the rate of change of cosine is minus the value of sine, the bigger sine is the faster cosine is changing. The size of one is the speed of the other, as it were. You can sort of see that from looking at the graphs for a few seconds. What this algorithm does is, every time around the loop it adds small part of sine to cosine and subtracts a small part of cosine from sine. That means the bigger one is the more the other one is being changed. The rate of change of one is proportional to the size of the other. Which is exactly what we want to draw out the sine and cosine waves. Further, subtracting 512 from the every output centres our circle about 0,0 nicely and when drawn against a "proper" circle it shows no distortion. See attachment. We end up with a circle of radius 7680. No doubt there are other powers of 2 will produce nice results as well. Oops, had to put the attachment here. Stupid forum. let cos = 8192;     // Amplitude, need not be any special value. Larger the better. const steps = 6487; // This number of  steps gives a full circle for the shift size used below. cos = cos + (sinNew >> 10);         // angular step sizes around the circle. I've turned my terminal screen into a "graphics" screen by setting the font size to 0.5 to give me plenty of resolution so each character is a pixel. @Heater: BTW, if you missed inserting the image into your post you can pretend to start a new post and insert the image into that as you would but grab the image link, save the current post as a draft, edit the previous post and paste in that link. Works like a charm and you can remove the link from the draft to keep it clean for next time although I haven't yet tried deleting the draft to see what happens. Hah! That must be the highest resolution ASCII art I have ever seen. Well it would be if I could make out the characters. Other Hah! That is some awesomely convoluted way of attaching to a previous post. cos = cos + (sin >> 10);         // angular step sizes around the circle. I think this is a feature of the algorithm (that no temps are needed). That is a very good point and one that has been bugging be for some time. Firstly the algorithm, as described to me in 1980 or so, when it was implemented in TTL hardware was, as you say, without those temporary variables. A year or so ago I tried to write this thing as you suggest without the temporary variables because I was sure they were not needed. It did not work, my circles were all kind of weird ellipses. // Note: Does not use the temporary "NEW" variables of the code in that link. And the resulting plot of the generated circle and a "real" circle. See attachment. Now I have no idea why I had such weird results before. Probably a silly error. Thanks for the push there. Blow me down, works perfectly for generating squares, sort of octagons, whateveragons, all the way to nice circles. and flexible approach and doesn't risk accumulating errors. grid (though you can relax this with fixpoint ops). I do agree that there is not much call for this now a days. However, can you produce the circle above, in less operations with Bresenham's algorithm? Let's talk generating the highest possible frequency of sine wave, with about the accuracy of the above, on a Propeller. Up for the challenge? I was thinking I should do this in PASM anyway. I thought that getting the same rounding behaviour when using shift instead of divide would probably produce a more accurate circle in the minsky algorithm. Turns out this is not the case. It's much worse! See attachment. The "circle" plot there is done with floating point, it is overlaid with minsky using shift, minsky using integer divide or corrected shift is way out. Minsky with integer divide or the corrected shift produces horrible circles! Some how the rounding errors of plain shift compensate for it not being floating point. Just to nerd out on numbers I get a maximum error in radius of 18 and an RMS error of 8. So 0.1%. Going up to a radius of a billion the absolute errors were about the same so 0.000001%. Not bad. It might just be me, but it seems that the green circle, and yes even the blue one at closer inspection, is actually a series of joined up straight lines, or many sided polygon. Even in my low resolution screen attempts I have noticed this, apart from the obvious 8 sided already mentioned. You are right. When you are working with a low number of bits you are going to end up with straight lines and "blocky" results. We are working with a division of 1024 here so you soon eat bits. Like I said above, start with a radius of a billion or so and your error is very small. How come, when I set the radius to 4096 we get a 20 sided polygon? An "icosagon" by the way. Here we are mashing around with multiples of 2, divide by 1024, radius 4096, and we get a multiple of ten popping up. Weird. Not what I would have guessed given that a radius of 1024 gives a square and 2048 is a sort of octagon. How many "sides" does that radius of 8196 have? Yeah, I know, I'm getting obsessed with this silly thing.